In this installment of our summer series about enjoying in-season organic produce, learn simple tips for highlighting kohlrabi in fresh, well-spiced meals. What if you took the flavor of the sweetest cabbage and put it in a crisp, juicy, round shape? That’s what kohlrabi is. Kohl-rabi, German for cabbage-turnip, is like kale and Brussel’s sprouts in that it is a specially selected variety of the common cabbage, bred for its succulent, tender stem, which can be eaten raw or cooked. The dark green leaves of kohlrabi also are edible with a taste similar to mild, sweet kale. How to prepare it: Select firm, freshly harvested stems, preferably with leaves still attached. Slice away the base (root) and top (leaf) ends. Wash the stem and leaves in cold water. Peel the green (sometimes purple) stem to expose the cream-colored inner flesh. Slice it into rounds, sticks or cubes to eat raw with salt and pepper or add it to salads and slaw for sweetness and crunch. Alternatively, the stem can be quartered and boiled until fork-tender and use like potatoes. Use the leaves as you would kale. Spices and herbs to complement: Adding sea salt and cracked pepper is the simplest way to enhance mild kohlrabi, whether raw or cooked. Try adding anise seed to shredded kohlrabi, apple and carrot slaw. Dress cooked kohlrabi greens with grated nutmeg and butter, and the boiled stems with caraway seed and browned butter. 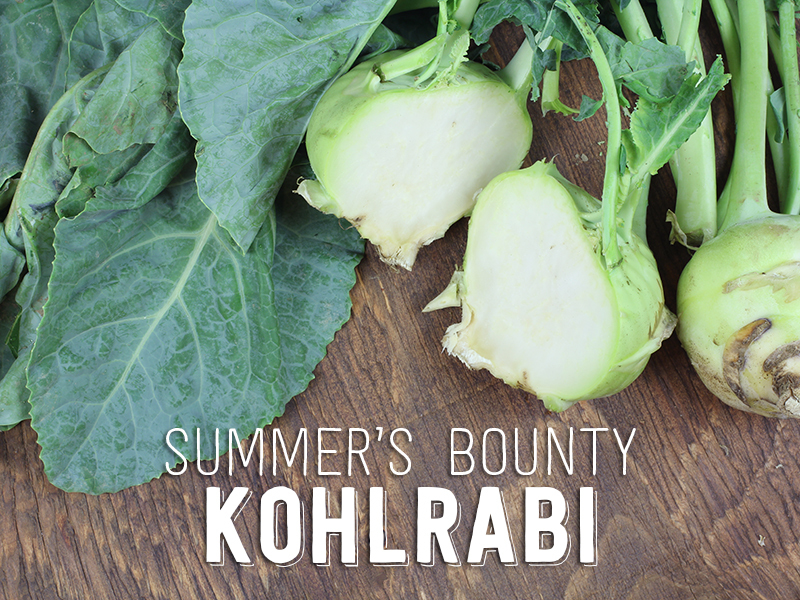 Pairs well with: Use apple cider vinegar, cream or buttermilk in dressings for raw kohlrabi. Pair cooked kohlrabi with cured pork, butter or Gruyere cheese. Kohlrabi is sweetest and most tender if grown in spring or fall. Two to four inches in diameter size is best; large kohlrabi can be tough and woody. Buy twice as many as you think you need so you can serve kohlrabi both raw and cooked. Use kohlrabi in salads and slaws to add healthy and lively crunch. Soak raw kohlrabi in iced water to enhance crunch and juiciness. What is your favorite way to eat kohlrabi? Yum, love me some kohlrabi!